Lilly Kimble shares the story of a banished West Kentuckian. American citizens being banished to Canada may sound pretty far fetched. But that is what happened to twenty one Hickman Countians during the Civil War. Columbus, a small town located on Mississippi River, opened homes and hearts to Confederate troops stationed at the fort overlooking the town. However those troops abandoned their positions when General Ulysses S. Grant bypassed them by taking Forts Donaldson and Henry in Tennessee. Grant was unable to take the fort, having been beaten back by Confederates under the command of General Leonidas Polk in his first battle of the Civil War, an event that is commemorated each year at Columbus Belmont Park in mid-October. Occupation of the fort after the Confederates decamped brought a Union army into an area known for its Southern sympathies. Commanding General Paine, an Illinois lawyer and friend of President Lincoln, prided himself on his strong Union sentiments. The combination of a town with Southern leanings and an occupying force commanded by a rabid Union man led to the expulsion of whole families from their homes. Paine took it upon himself to exile local residents he called "Southern sympathizers" to Canada. Two sisters from Paducah, who had the misfortune to possess fine homes, were also put on the northbound train by Paine’s troops. Then Paine used their homes as his headquarters. Family members recounted the train ride to Ottawa, Canada and their return home. Some families returned soon after President Lincoln, prompted by a petition from the people of Columbus, ordered Paine to recall the banished. Six weeks after they were "shipped like cattle out of their own state" according to one newspaper report, some returned home. Many came back to nothing because the Yankees had burned their homes and taken their livestock. All who came home had to pay their own way back. This little known Civil War event was dramatized in 2006 by Hickman County historian, Virginia Jewell, before her death in 2007. It was put on again in 2009 by the Hickman County Museum Board. Now it’s back in time for the 150th year anniversary of the beginning of the War Between the States. The play, originally titled “Banished to Canada” now known as “Banished” will again be performed with slight revisions, children are now in the cast and music of the period is included. Eight men and four women will tell their story of being banished to a foreign country. The play, produced by the Hickman County Arts Council will be performed twice. 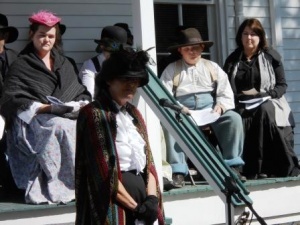 The first performance will be on Saturday, October 8th at 11:00 on the porch of the Hickman County Museum in Clinton. The second performance will be at Columbus Belmont Park on Saturday, October 15th at 11:00 at the Park Museum. Admission to both performances is free and the public is encouraged to attend.